First, get into the spirit of the season by participating in our Annual Pumpkin Carving Contest. We provide the pumpkin, you do the carving! 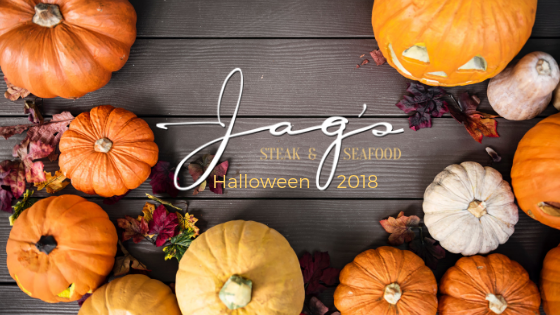 The contest will take place Thursday, October 25th at Jag’s. Contest participants need to have their pumpkin set up at the restaurant by 6 p.m., with judging beginning at 6:30 p.m. Winners will be announced at 8:30 p.m. with prizes awarded! Contest participants and guests will also be able to enjoy a first come, first serve buffet. Buffet is $10 per person, or complimentary for contest participants and one guest. We can’t wait to see your boo-tifully designed pumpkins! First and second place winners in each category will be awarded prizes that you don’t want to miss out on! You must be 21+ to attend. Prizes TBA. Stay up-to-date on upcoming events for the Holiday season on our website, or by liking us on Facebook.